From the Cumberland Gap to the Atlantic Ocean, this is Virginia Water Radio for the week of June 10, 2013. This week, we feature another mystery sound. Have a listen for about 10 seconds, and see if you can guess what’s making these clicking and chirping sounds. And here’s a hint: this creature shares its name with pioneer fences and the track of an iron horse. After the sound, enjoy about 35 seconds of an instrumental tune done by a Virginia composer in honor of the sound-maker. If you guessed a Virginia Rail, you’re right, and you won’t be surprised to hear that the music was “Virginia Rail Reel,” by Timothy Seaman on the 2004 CD, “Virginia Wildlife.” It’s questionable whether the expression “thin as a rail” refers to the bird family of rails, of which nine species are normally found in Virginia. But there’s no question that rails’ thin bodies allow them to run, swim, feed, and nest within the dense grasses and other plants of saltwater and freshwater marshes. 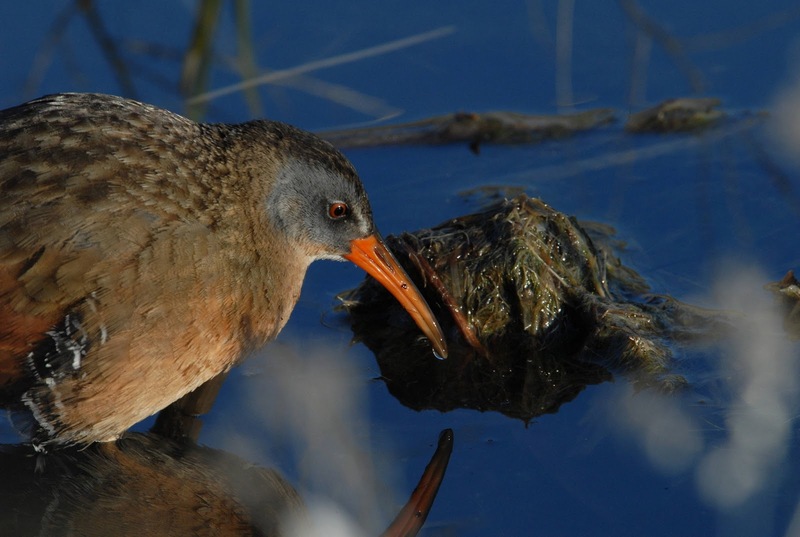 From the Clapper Rail, to the Common Moorhen, to the Purple Gallinule, to the American Coot, rails have descriptive names, distinctive calls, and adaptations well-suited to marshy habitats. Thanks to Lang Elliott and Timothy Seaman for permission to use this week’s sounds and music, respectively. Virginia Rail. 2010 photo by Dave Menke, courtesy of U.S. Fish and Wildlife Service National Digital Library, http://digitalmedia.fws.gov/cdm/, 6/10/13. Acknowledgments: The sounds of the Virginia Rail (Rallus limicola) were taken from the Stokes Field Guide to Bird Songs-Eastern Region CD set, by Lang Elliott with Donald and Lillian Stokes (Time Warner Audio Books, copyright 1997), used with permission of Lang Elliott, whose work is available online at http://www.langelliott.com/ and the “Music of Nature” Web site, http://www.musicofnature.org/ (as of 6/10/13). Music on the CD “Virginia Wildlife” is copyright 2004 by Timothy Seaman and Pine Wind Music, used with permission. Mr. Seaman’s Web site is http://www.timothyseaman.com/. The “Virginia Wildlife” CD was a collaboration between Mr. Seaman and the Virginia Department of Game and Inland Fisheries; for more information, visit https://www3.dgif.virginia.gov/estore/proddetail.asp?prod=VW219. Information was taken from the Virginia Department of Game and Inland Fisheries’ “Fish and Wildlife Information Service” Web page at http://vafwis.org/fwis/?Title=VaFWIS+Species+Information+By+Name&vUT=Visitor; from Life in the Chesapeake Bay, by Alice Jane Lippson and Robert L. Lippson (Baltimore: Johns Hopkins University Press, 2006), pp. 232-3; and from A Guide to Field Identification of Birds of North America, by Chandler S. Robbins et al. (New York: St. Martin’s Press, 2001). *Cornell University Lab of Ornithology’s “All About Birds” Web site at http://www.allaboutbirds.org/guide/search, and the “Birds of North America Online” Web site from the Cornell University Lab of Ornithology and American Ornithologists’ Union, online at http://bna.birds.cornell.edu/bna (subscription required for this Web site). Both Cornell sites include photos, distribution maps, recordings of calls, and ecological information on birds throughout the Western Hemisphere; a subscription is required to use the “Birds of North America Online” site.